Second World War at Sea: Sea of Iron is a game designed for action, destined by geography. The Baltic Sea is tiny, as seas go, but the Swedes, Soviets and Germans (and some smaller powers) bring many ships and planes to the table. A clash is pretty much inevitable. 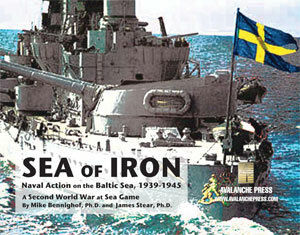 Sea of Iron covers World War II in the Baltic from 1939 to 1945. The new Second Edition includes the fully-revised Second Edition series rules, plus full-color play aids. The iron in the title drives a lot of the action, as the Germans seek to secure their supplies of Swedish iron ore and the Soviets try to interrupt the traffic. But that’s not the only dynamic at work. The game covers all of the major campaigns in the Baltic, both those that took place and, as is our way, those that could have taken place. It starts with the Polish campaign of 1939, as the small but efficient and brave Polish fleet faces overwhelming Nazi sea power. It wraps up with Sweden’s planned May 1945 intervention in Denmark. In between those, the Soviets attack Finland while Sweden ponders intervention, the Soviets think about attacking Sweden, the Germans attack the Soviet Union (while Sweden again ponders intervention), the Germans think about attacking Sweden, the Swedes think about attacking the Soviets, and the Soviets drive the Germans back. Because of the force mix and the very tight geography, the scenario set is different than those we’ve done before. The Baltic Sea is very small, which puts all of it within range of most aircraft (and puts most aircraft within range of each other). And there are a lot of airplanes: large air forces from Germany, the Soviet Union and Sweden, and little ones from Finland and the Baltic States. The fleets reflect that reality, with coast defense ships and light craft playing a bigger role than in other games in the series. When those fleets steam out to do battle, they’ve got a good chance of meeting something (if only a minefield). I went with a heavier mix of battle scenarios as opposed to operational ones than is usual in a Second World War at Sea game. This is something I started doing following the arguments of Nick Rider. I came to like them more and more as a storytelling device, and I think they do particularly well in that regard in the Baltic, where contact is so much more likely given the narrow sea and the presence of many aircraft (even if the pilots are often reluctant to take on naval missions). Sea of Iron has a great number of pieces for such a small map. There are three major fleets present, from Sweden, Germany and the Soviet Union. There are small ones from Poland and Finland, and tiny ones from the three Baltic States. After years of trust in the League of Nations, the Swedes awakened in the years just before war broke out and made serious efforts to modernize their war machine with both foreign purchases and domestic production. Swedish naval power is built around their coastal battleships. They still have some of their older ships in service, dating to the turn of the century. While these were heavily modernized during the late 1930’s, they remain limited in their combat capability and the Swedes intended them to serve in the inner layer of their naval defenses. The outer layer would be formed by the three larger, more powerful ships of the Sverige class, each armed with four 11-inch guns. Built during and after the First World War, they began to show their age in the 1930’s and received modernizations as well. These ships would find and engage the Soviet or German enemy invasion fleet on the high seas (as much as the middle Baltic can be called a high sea) along with the fairly large flotilla of modern destroyers. We’ve included all of those ships, of course, plus the ones the Swedes wanted but did not build, starting with the fourth ship of the Sverige class. “Fourth ship” became shorthand in Swedish naval and political circles for renewed construction of heavy warships in Sweden, long after the construction of an actual fourth Sverige had become unlikely. The Swedes also receive a full class of the modern 1930’s coast defense ships designed for them by Ansaldo, with six 11-inch guns, and the American heavy cruisers the Swedes tried to purchase to bring modern ships into service faster. Germany’s Baltic Fleet is usually based on light ships: destroyers, torpedo boats and mine warfare vessels. Just as in World War One, mines are a big deal in the Baltic. The German heavy ships (Tirpitz, Scharnhorst, Prinz Eugen, a couple of “pocket battleships”) do make a few appearances: during the planned invasion of Sweden, during an actual operation to intercept a Soviet breakout attempt, and during the last days of the Reich. The Red Banner Baltic Fleet is an amalgam of several competing visions: ships left over from the Tsarist regime, when the Romanovs dreamed of a blue-water navy, to smaller craft more suitable to the theater built under the initial Soviet naval plans, to fresh attempts to fulfill Josef Stalin’s blue-water delusions. The Soviets get a pair of old dreadnoughts somewhat modernized during the 1930’s, and the proposed radical rebuilding of a third sister. And then they have the new heavy ships designed for Great Stalin, a huge battleship and a fast battle cruiser. Real Soviet naval power lies in the very large array of destroyers, both modernized and still capable older boats and new models. These are backed by cruisers, but surprisingly given the Russian mastery of minecraft during the Great War the Soviet mine establishment is very weak, with no fleet minesweepers available at all during the early years of the war. Polish naval power, such as it is, is built on a flotilla of big, fast and powerful destroyers. They see some action in 1939, but they are severely outnumbered. Finland went the other way, with heavily-armed coast-defense armored gunboats. Neither fleet made much of a difference in the war, though the Polish destroyermen fought bravely for the Allied case on distant seas.